I have tried creating new interpreters in other directories, I have turned off UAC, and have tried running PyCharm as administrator. Any other suggestions? Could you please attach a screenshot of your run configuration settings? Thanks Dmitry. Here they are. Please try going to Settings | Python Interpreters, deleting and recreating your Python interpreter. This should solve the problem. Here are my log files in case they help. Hi Dmitry. Do you have any more suggestions please? I have tried multiple re-installs with no joy, and I'm out of ideas. Thanks! Hello Dmitry - any response on this please? It's still a problem. "Cannot run program "C:/Python27/python.exe" (in directory "C:\Python27"): CreateProcess error=2, The system cannot find the file specified "
Definitely something wrong happened to your environment. Can you manually launch python.exe? Probably some environment variables are not set appropriately. Please reinstall python on your machine.The directory with python installed and all its files should have appropriate rwx access mode for your user. 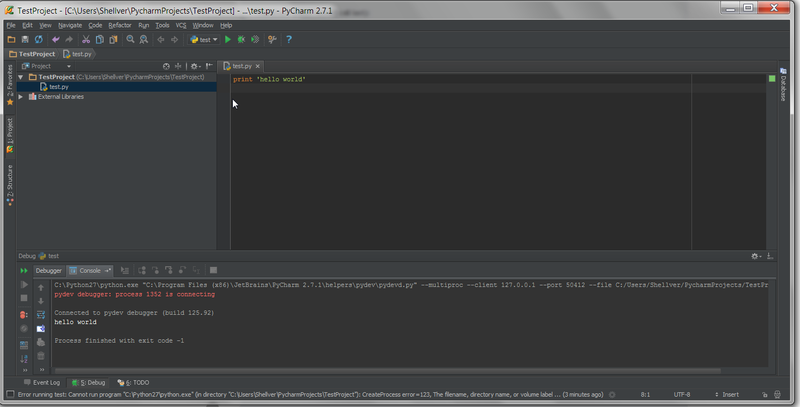 After that run PyCharm... go to Settings | Project Interprreters | Python Interpreters. 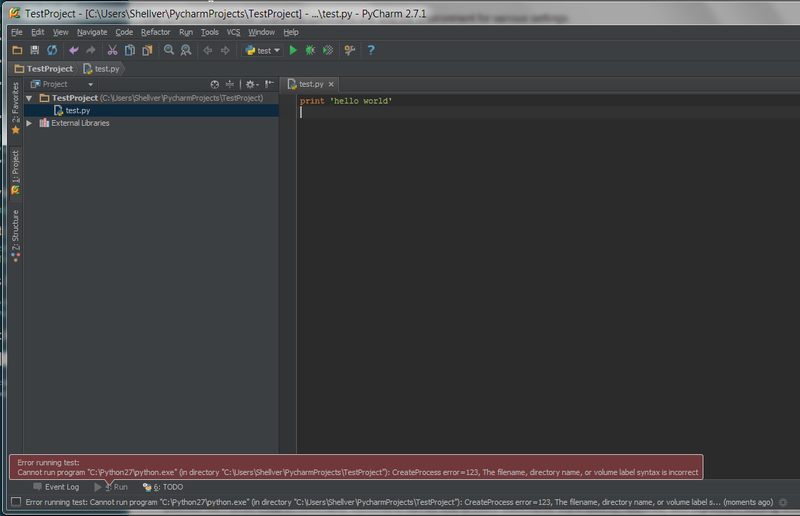 I'm sorry to say it's actually got worse: PyCharm won't even run now! It hangs during startup. The machine is generally ok: running ms office, visual studio, and allowing me to develop in python using notepad / idle etc. Don't worry about it Dmitry. 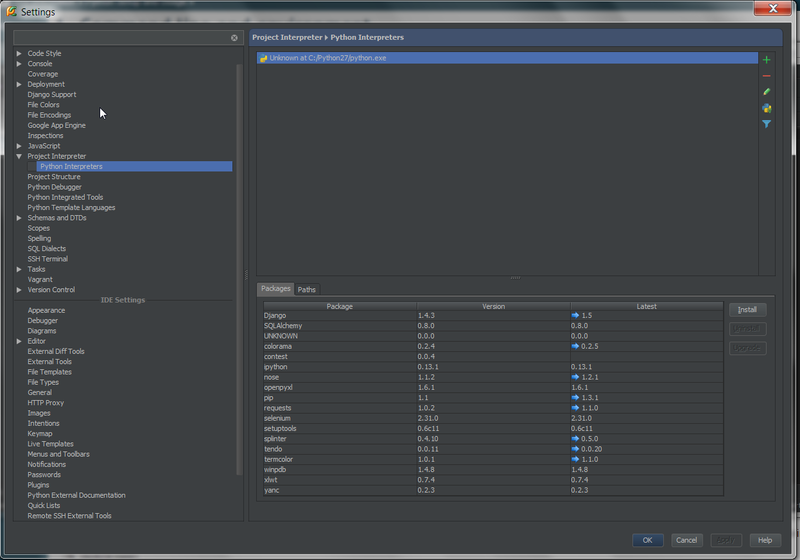 I'd say it's something to do with my setup rather than PyCharm itself. When I have time I'll have another go at it and try to get as close to a fresh install as possible. Thanks for you help anyway. file located here: "<local project location>\.idea\workspace.xml"
Thanks for the suggestion Ryan. I'm not using Python these days but hopefully somebody will find that useful. Thanks for sharing! @Ryan Elfman: Thanks! This solved this exact problem I have been having after I renamed some folders and launched PyCharm. Hey, you never know when a PyCharm newbie may need help!